Whizbang cider pressing fabric being used to make a cloth-wrapped bag of mash for rack-and-cloth pressing in the Whizbang cider press. As I explain in This Essay I'm a firm believer that rack-and-cloth cider pressing is far superior to other cider pressing methods. That is, I suppose, why most all commercial cider operations use a rack-and-cloth system. 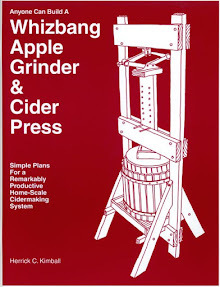 But, for some odd reason, my Whizbang cider press is the only home-scale press on the market that promotes the rack-and-cloth approach. 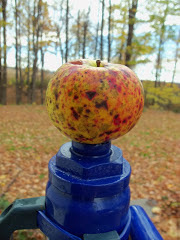 I believe this will change in time as other cider press manufacturers are faced with the reality of their inefficient presses (inefficient when compared to the Whizbang). 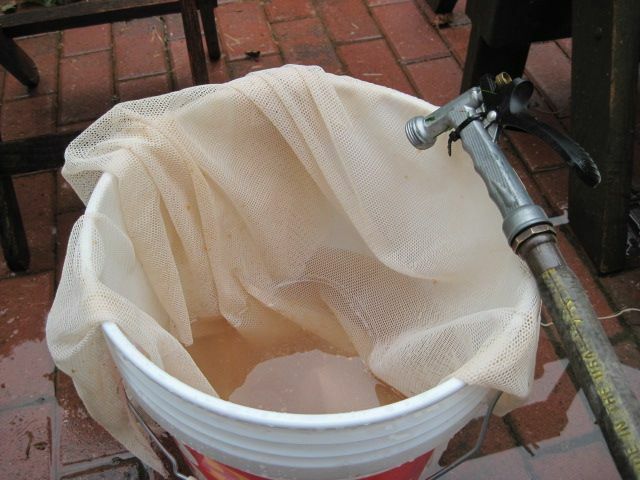 All the other home press makers recommend a single pressing bag when squeezing cider. 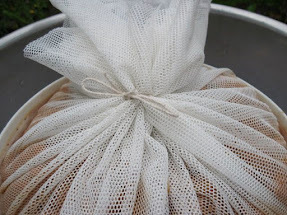 But you don't need one of those pressing bags for rack-and-cloth Whizbang cider pressing. 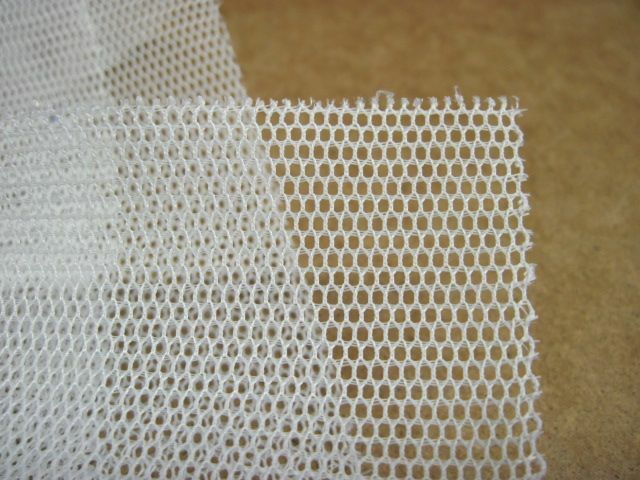 Instead, you need simple squares of a strong, porous fabric. 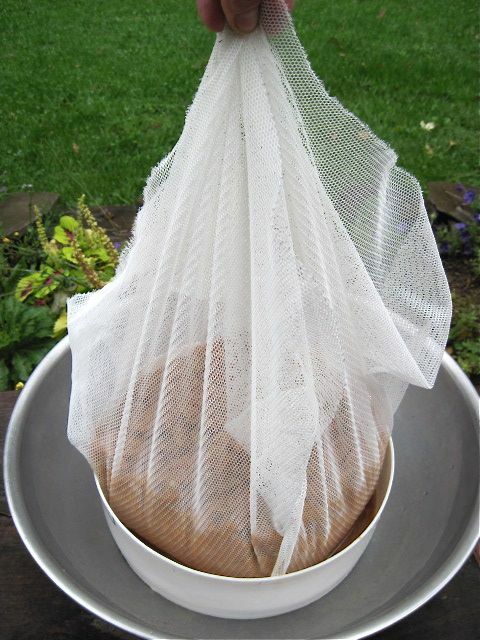 I used to use sheer nylon curtain fabric for pressing cider. Such material is often available in fabric stores for not much money. But it isn't easy to find sheer-curtain material that is strong enough for pressing. 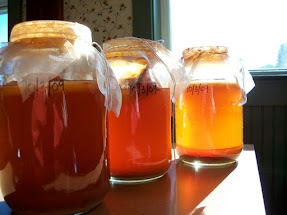 That being the case, I figured it would be a good idea to start selling top-quality, professional cider-pressing fabric— fabric that is specifically designed for the work of pressing cider. Fabric that you can depend on. 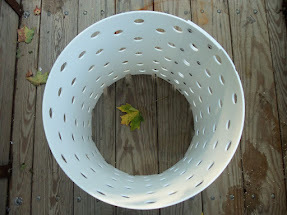 If you have seen the cider pressing bags that other cider press makers sell, you are familiar with this kind of fabric. Technically, it is a woven polyester. I sent a pressing bag from Lehman's Hardware in Ohio to the textile factory where we now get this material. They analyzed it and presented me with several similar options. I settled on a fabric that is rated as stronger than what Lehman's uses to make their pressing bags. This fabric is used in industry. It is made to last. 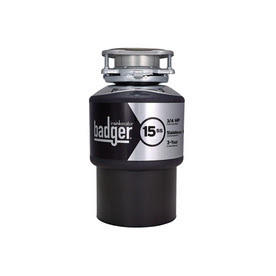 And it also meets FDA requirements for food processing applications. I have now used and sold this fabric for several years, and I can vouch for its durability! The 30" x 30" squares of pressing fabric that I sell are sized to work just right for rack-and-cloth pressing in the Whizbang cider press, as I show in This YouTube Video. 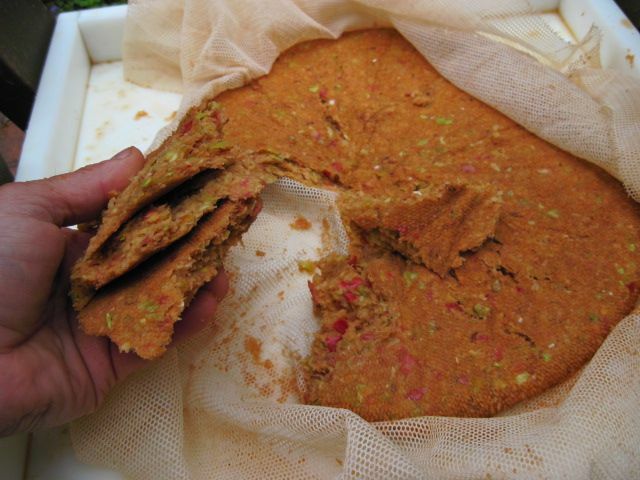 The picture at the top of this page shows a 30" by 30" square spread over a mash form (which I tell you about at This Essay) and then filled with apple mash from the amazing Whizbang apple grinder. Here's a picture of the fabric corners brought together before tying with string. Here is a closer look at how the bag is tied with a piece of cotton string (a 16" to 20" length will do nicely). 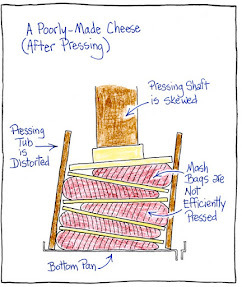 Then, of course, you place the bag onto the bottom of the pressing pan, lay a round pressing disc on top, followed by another bag of mash, and another rack, and so on until the stack (traditionally referred to as a "cheese") is assembled. This is all shown and explained in more detail in my YouTube video link above. Next, you can see the same bag of mash pictured above after pressing. It has been flattened considerably and a lot of juice was squeezed out. I'm untying the string. The fabric did a fine job of holding in the mash but letting out the juice. This next picture shows the pomace that remained. It had a moist-dry texture to it, like a wrung-out sponge. Rack-and-cloth pressing extracts more juice for a given amount of mash than does any other cider pressing technique—and it presses the juice out faster. I rinsed the pressing fabric off in a bucket of water and it cleaned up much easier than some other pressing fabrics I've used (in the form of pressing bags). 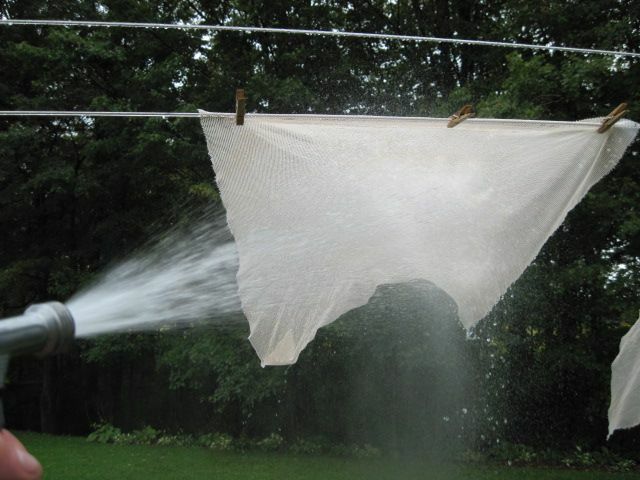 I also hung some of the fabric on the clothes line and found it sprayed clean with the hose quite easily. I sell the 30" by 30" pressing fabric in sets of five squares. Five is how many bags of mash you can press with four pressing discs (racks) and a pressure plate, as I recommend in my plan book. 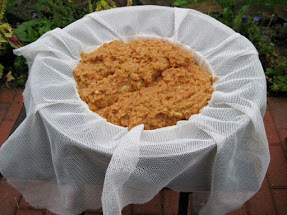 If you are planning to make a lot of cider and will have lots of help, I suggest you get more than five squares of fabric. 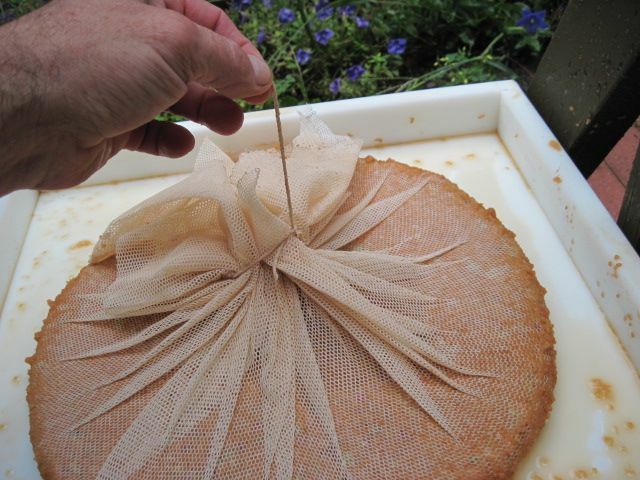 That way, you can be pressing a cheese while your help is making bags for the next pressing. 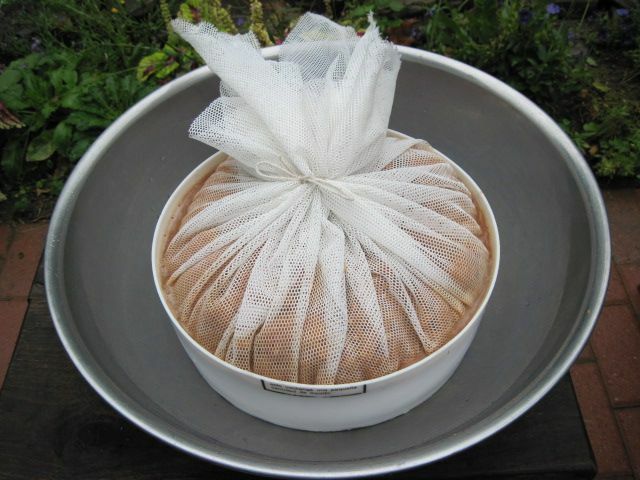 The mash bags can be stored in a plastic pail until you're ready to press them. Shipping: US Postal Service First Class shipping is included in the following prices. Price: Choose quantity and price from the drop-down menu below. We've been told that our cider pressing fabric cleans easier and strains juice faster than other commercial-grade cider pressing fabrics on the market. But the standard 30" x 30" fabric size that we sell for Whizbang cider pressing is too small for most commercial cider pressing operations. 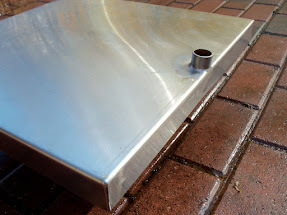 For example, the press board pictured above measures 24" x 24" and requires a 36" x 36" piece of pressing fabric. The good word about our pressing fabric has really spread on the internet, and in 2015 we began selling larger sizes. 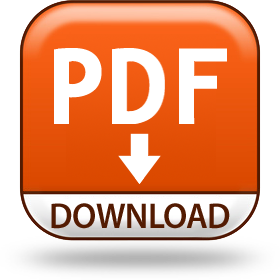 Specifically, we are custom cutting lengths off the roll, and selling them by the yard. The roll is 60" wide. So, for example, if you purchase 1 yard of material, it will measure 36" x 60." Or, if you purchase 5 yards of material, you will get one large piece that measures 5 yards (15 feet, or 180 inches) by 60" (5 feet). You can then cut the fabric yourself to the exact sizes you need. You can also hem the edges yourself, if you feel it is necessary. But it really isn't necessary. Price: $16.00 per yard, postage paid. How to Order: Click "Add to Cart" button, then indicate quantity (total number of yards wanted) in the shopping cart. 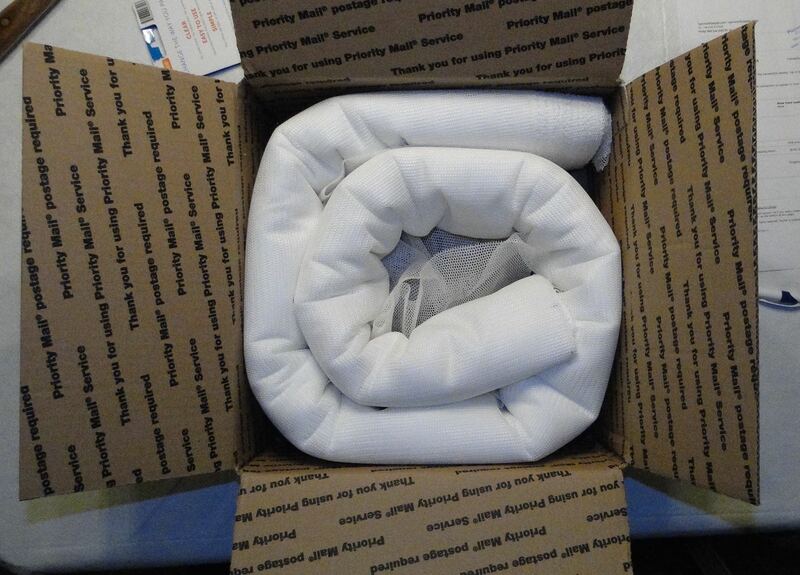 Whizbang cider pressing fabric In the box, ready to ship.